Meals on Wheels may be something of the past for your local raccoon. Last month, the City of Toronto announced their latest move on the war against raccoons. Will other city’s like Hamilton, follow suit? What is considered to be the tamper proof compost bin will hit Toronto neighbourhoods in 2016. The $31 project will see Toronto’s 500 000 compost bins (green bins) replaced with new ones that are twice as big and raccoon proof. While this is welcome news for some, there are others that hope they are not just creating smarter critters. The city of Hamilton and no doubt, other neighbouring cities are keeping watch to see how the raccoon versus green bin saga ends. The new bins are taller and more stable. Raccoons will no longer be able to stretch on their hind legs and reach the top of the bin. The new latch that requires dual movements to open, will ideally keep the raccoon out and Toronto is counting on their lack of opposable thumbs to foil their attempts. Although the city of Hamilton has no immediate plans to replace their fleet of compost bins, Toronto’s plan may just work and we probably have not heard the last about these new super bins. Until we can out smart these rodents with a better build bin right here in Hamilton, there are a few things we can do keep them out of our scraps. Experiment with a variety of bungee cords and rope to keep the lid down, but don’t be surprised to find a raccoon inside on garbage day, helping himself with the lid closed. Even the most ingenious combination of locks and knots, won’t keep out the smartest raccoons but we don’t have to make it easy on them. Try to find a way to keep your bin upright. As soon as a raccoon can figure out how to knock your green bin over, it becomes much easier to access what’s inside. While the raccoons may still be able to help themselves, it would not get pushed over, creating a huge mess to be cleaned up week after week. Keep your green bin tucked away till garbage day. Even a dieting raccoon would not be able to resist if it is left out in the open. Where possible, store your green bin in a shed or garage or along the side of your home. As well, if you only need to put your green bin out once every other week, this will reduce its exposure to these cunning little creatures. Keeping your green bin sheltered will also keep the flies and inevitably the maggots away. Since the implementation of the green bin program in 2006 in the City of Hamilton (http://www.hamilton.ca/) , 35 percent of waste has been diverted from our only landfill site. This means that your green bin is now ten years old and likely in need of replacement soon. City Hall is looking into these new bins in consideration of their own replacement program. You can bet they will be keeping an eye on Toronto’s green bin program and those shiny new raccoon proof bins. 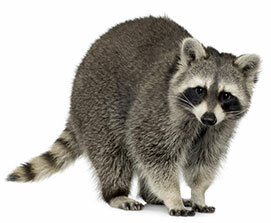 Contact us for further information on our raccoon removal services. This entry was posted in Blog on 2015/05/04 by Any Pest.